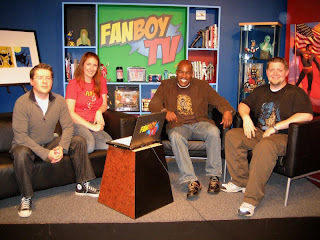 A couple of weeks ago, I was asked to be the in-studio artist on the 3rd episode of the all new Fanboy TV. It's a live internet tv show that's taped in Dallas twice a week. They have the artist come on first and interview them. Then the artist goes off and creates a drawing while the rest of the show goes on. The guest after me (via webcam) was only Joe Quesada, no pressure right? Then artist comes back, participates in the "Sub of Flub" segment and then reveals the peice they created. 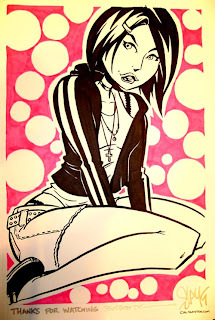 And the cool thing is, they give away the artwork in a drawing of people from their message board. Here is my interview segment.They have problems getting my mic going at first but it kicks in pretty quick. Me participating in Sub or Flub. Here's the reveal of the peice I created. They have technical troubles at first, the screen is stuck on their website, but it eventually comes up. Below is the peice I created and a shot of me with the guys on the set.